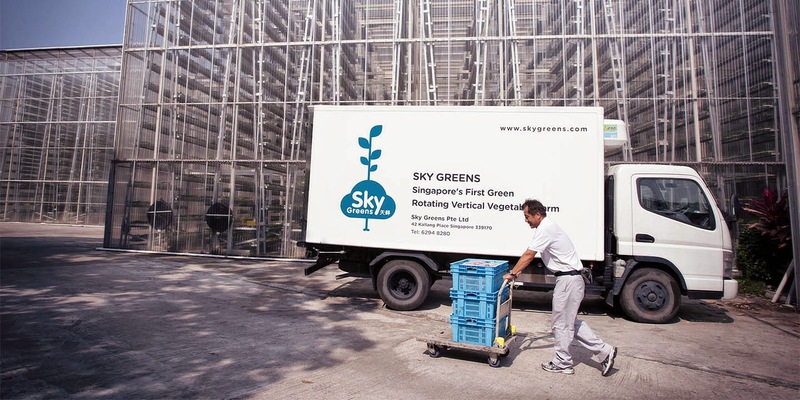 Mr Jack Ng from Sky Greens based in Singapore, has built the first low carbon hydraulic driven vertical farm, to grow sustainable and cheap vegetables for the island nation's use. Because the the arable land is so scarce in Singapore, radical rethinking has had to take place. 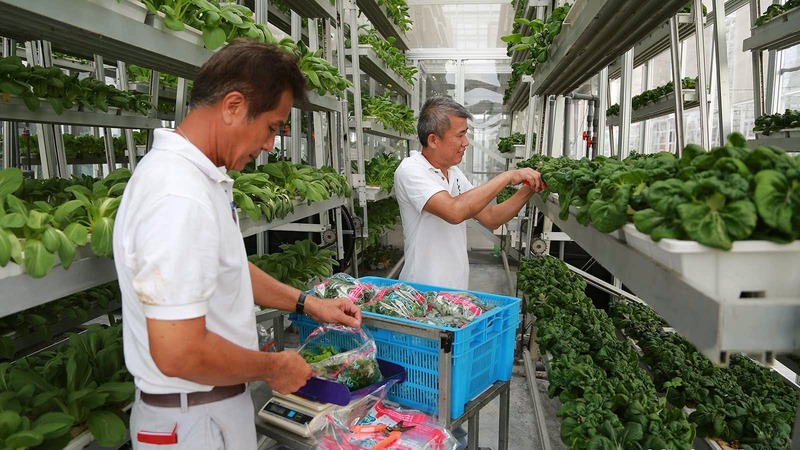 It is estimated that Singaporeans only grow 7% of their vegetables, the rest is imported from all around the world. Because of its position in-respect of the equator. the nation has a stable warm and sunny climate all year around and during monsoon season the climate control enclosed structure, protects from the force and quantity of rain that comes down during that period. These are the promises this type of farming makes: High yield, quality, flexibility, low energy and water use and little maintenance. We will go into more detail below with the video and more information. 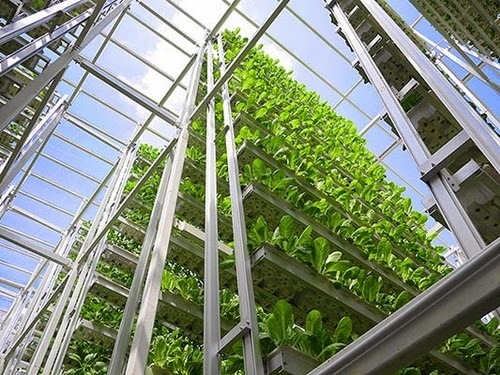 If you like this post you will love these other two that are looking at different ways to increase productivity and bringing farms into our cities, lessening the effect we have on the land: Container Greenhouse / Urban Farm Building. The 9m (29.5 Feet) high "A" shaped carousels, rotate at very slow speed to give every plant, on the 38 tiers, the right amount of daily light. 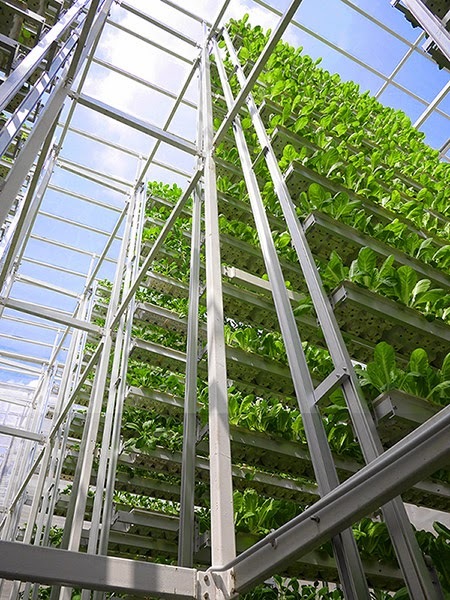 This system can accommodate plants grown in soil or hydroponics. Watering and nutrition happen at different stages of the rotation. 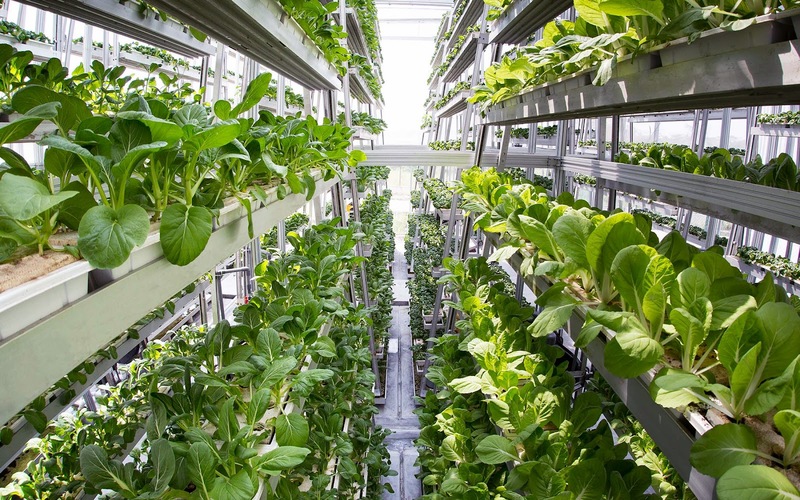 High Yield, because of their vertical structure, Sky Greens, calculate that this system can produce, at least 10 times more produce, compared to conventional farms with the same amount of land. High Quality, is achieved thanks to its enclosed structure, less problems from environmental factors, like pollutants in the rainwater or too much rain, easier pest control and the fresher when it arrives on your plate, as it hasn't had to travel half way around the world. High Flexibility, thanks to the ease with which structure is constructed, it can be tailor-made to the specific crop grown. This system overcomes the state of the original land, you can set-up one of these systems on desert or rocky land and it would not make a difference to the quality and the yield. Low Energy Use. If you have sufficient sunlight you don't need artificial lighting, like in the case of Singapore. In running the system, they have observed that to turn the 9m (29.5 Feet) frames utilising their patented momentum of flowing water and gravity to rotate them, each one has a monthly running cost of $3, the equivalent of running a 60W light bulb for a moth. Low Water Use, as the water is an integral part of the rotation system, as well as for irrigation, only 0.5 litres of water is required to rotate the 1.7 ton vertical structure. There is no water run-offs, the evaporation is reduced in this temperature controlled environment and the water is recycled, all this lessens the total amount of water needed to run the farm. Low Maintenance, is achieved thanks to its enclosed structure, less pests, no weeds and seeds (weeds) transported by the winds that could compete with the produce. Travelling distances are greatly reduces, you just stand there and wait for the trays to go around, to tend to each plant. No back breaking bending, as you deal with the plants when they are at the right height for you. Amazing systems with a lot off promise for the future, what do you think?